Can My ISP See What I'm Doing If I Use a Virtual Machine (VM)? - Ask Leo! Can My ISP See What I’m Doing If I Use a Virtual Machine (VM)? A VM doesn't get you any additional privacy from your ISP... although it might be a convenience as part of a more complete solution. In your article Can Everything I Do Online Be Monitored at My Router? you state that “your ISP can see everything you do”. Is that still true if I run a virtual machine to hide what I’m doing? Yes, it’s still true: a VM doesn’t get you any additional privacy from your ISP. I do need to clarify exactly what “everything you do” means. I’ll also revisit what you need to do to avoid ISP monitoring. Hint: a VM isn’t the solution, but might be a convenient part. To refresh: a virtual machine, commonly referred to as a “VM”, is software you run on one machine in which you create a simulated environment of another. The best way to conceptualize that is with a picture. Here’s a snapshot of my Mac Pro’s desktop. Your ISP only sees the connections your computer makes to the internet. That means it has no concept of what software is making those connections, outside of anything those connections imply. So when my browser makes a connection to askleo.com, my ISP can see it, regardless of whether I do it in the native browser — Chrome, in the example above — or in a browser within one of the virtual machines. My ISP just sees there’s a connection being made to askleo.com by some machine at my IP address. This is very similar to what happens if you have more than one physical computer: your ISP cannot generally tell which is making the connection. 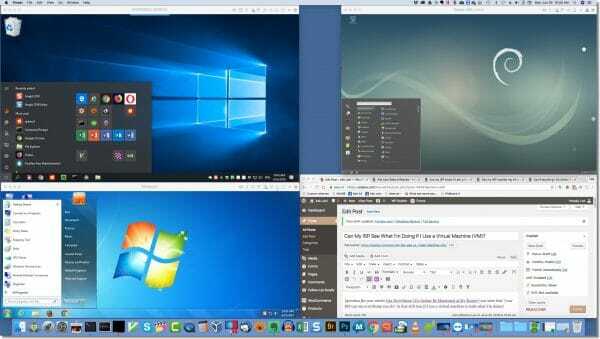 The rule of thumb is that virtual machines behave just as if you had multiple, different, real computers. If you connect to askleo.com, your ISP can tell you’re probably running a web browser. If your connection is unencrypted, and your browser includes information that says “Hi! I’m Google Chrome” as part of the conversation, your ISP might see that. In fact, any information in an unencrypted connection could be seen by your ISP and used to infer what software you’re running to create that connection, and what that connection is used for. More interestingly, though, it’s the services we connect to that expose some of what you’re doing. If you connect to a VPN (virtual private network) service, your ISP can see that you’ve done so, but cannot see beyond that. If you connect to a TOR (The Onion Router) anonymization server, your ISP can see that you’ve done so, but cannot see beyond that. But it doesn’t matter where those connections originate on your machine: from the programs you run directly, or from programs run within a VM; to the ISP, they all just look like connections and data transferring to and from your internet connection. If you don’t trust your ISP, things get difficult. Honestly, the best privacy solution is to use a VPN. As long as it’s correctly configured, your ISP will still see that you are using a VPN, but they are not able to see what sites or services you are connecting to, or what data you’re exchanging with those sites. Finally, one approach that might be convenient, if you’re so inclined, is to set up a virtual machine that uses one of these technologies. That’s nothing more than a convenience, though, and doesn’t increase your privacy. All it does is make it easier to run a virtual machine that’s pre-configured with your favorite VPN or TOR — exactly as if it were a different always-ready physical machine at your location. 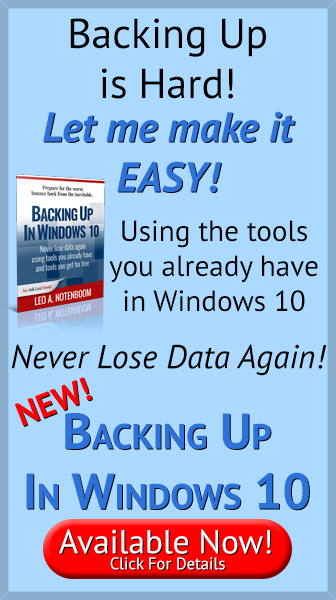 Can I isolate Windows XP in a virtual machine to stay safe? - Unfortunately, as Microsoft ends support for XP any strategy to make it 100% safe will also render it virtually useless. A virtual machine does add some protection, just know the pitfalls. How do I check a website for malware without infecting my own machine? - This is a difficult problem to solve. Steps to protect yourself from a malicious website could mask the problem so you never see it. I can give you a few suggestions. 1: Performance is amazingly good. On my machine (a four-year-old 12-core Mac Pro) I’ve successfully run Windows 98, XP, Vista, 7, 8, and 10, all at the same time, for fun. While not ideal, the fact that this was even possible is pretty impressive. In addition, askleo.com itself is a virtual machine. Virtual hosting providers use exceptionally high-end servers with multiple cores and lots of disk space and RAM to host multiple instances of various servers for various customers. That the askleo.com server is on such a virtual host is completely transparent to it: it thinks it’s on a dedicated server. 2: Even this isn’t absolute. While your ISP can’t decrypt the data, they might be able to compare characteristics of your download against known downloads of specific files. As a grossly oversimplified example, if they download a specific movie and you download the same movie, the encrypted data might look identical, so they would “know” what you’ve downloaded. « Previous post: Where’s My Disk Space Going? When I started reading that article, I wondered if, maybe, the person asking the question confused VM (Virtual Machine) with VPN (Virtual Private Networking). Then you eventually discussed how a VPN works, so even if the person asked the wrong question you covered it anyway. It’s quite possible, and indeed, that was part of my approach to the answer. Unfortunately some Dial up VPN connections leak DNS requests by default, so people may believe they are correctly setup but in fact are still leaking information to their ISP. HI Leo what about Proxy servers like the one in Opera web browser? can they still see threw it like normal browsing. i seen you covered VPN and VM but said nothing about proxys? A proxy is in a sense a more limited form of VPN. The proxy provider can see everything that goes through the proxy just as if they were your ISP. I’ve always looked as a VPN basically as an encrypted proxy. That’s off the mark, in my opinion. Proxies can be (and often are) encrypted as well. I think of Proxies as browser-based web-pages only, whereas VPNs should handle all internet traffic. how do I know that my VPN (I use Kapersky) is correctly configured? There’s no way to know for sure but in addition to the question of DNS leaking, it’s necessary to be able to trust your VPN. This article discuses Kaspersky Internet Security but it applies equally to any of Kaspersky’s products. Your VPN has access to all of your unencrypted internet traffic and all of the sites you visit. The integrity of your VPN provider is extremely important. Impossible for me to say. I’d check with the VPN’s support options. Regarding the various versions of Windows you’ve tested in VMs, I would imagine that Windows 98, XP and Vista are so old and no longer updated that you would simply disable the ethernet connection in the VM, and those are then in effect in a closed sand box. Otherwise, same as the PC. True. Unfortunately, though, that typically means disabling the network connection which dramatically reduces their ability to access even other machines locally. I don’t, but if you google “vpn leak test” you’ll likely get some good results. In addition to DNS leaks there are problems with WebRTC leaking information, whilst this is apparently a browser problem it is a concern.